Interest in PADs among mental health stakeholders has emerged largely since the 1991 passage of the Federal Patient Self-Determination Act, which introduced new government requirements to implement advance-directive policies at health care facilities receiving funding through Medicaid and Medicare.6 In recent years, PADs have been promoted as perhaps the most promising alternative or remedy for the use of coercion in mental health services for adults with serious psychiatric disorders. Specifically, the extension of involuntary treatment into community mental health care—the promulgation of outpatient commitment and other forms of mandated treatment outside of institutional settings7—has galvanized opposition and fueled increasing interest in PADs, particularly among consumer advocacy groups promoting ideals of recovery, empowerment, and self-directed health care.3,4,8 A typical statement expressing this view appears on the Web site of the Mental Health Association of Texas, one of the most recent states to pass a PAD statute: MHAT [The Mental Health Association of Texas] opposes the use of involuntary outpatient commitment law. … MHAT believes that the answer to the current system’s inability to serve a high-need but difficult-to-serve population lies not via court-ordered services but through  the expanded use of advance directives, which allow consumers to determine the type of treatment they want when they become incapacitated, as an alternative to the use of involuntary treatment and  adequate funding for [services for high needs populations] (emphasis added) [Ref. 9]. Critics claim that outpatient commitment has been falsely justified as the better option, given a perverse choice between coercion and neglect. In contrast, PADs appear to offer a more positive alternative: the possibility of both patient empowerment and engagement in beneficial treatment (i.e., by consensus between patient and provider). All states permit some form of legal advance directive (AD) for health care, which can be used to direct at least some forms of psychiatric treatment. Typically, these instruments authorize a surrogate decisionmaker with a Durable Power of Attorney for Healthcare to act in accordance with an incapacitated patient’s previously expressed wishes and known values, or to act in the patient’s best interest if the patient’s preferences are unknown (substituted judgment). ADs first were designed to control decisions about end-of-life treatment, typically to limit life-sustaining medical interventions that fail to provide a meaningful quality of life for terminally ill patients. The legal instruments have been adapted to the context of advance care-planning for persons who may anticipate a future episode of acute psychiatric illness. However, general advance directives have some limitations when applied to mental health treatment decisions for psychiatric patients with fluctuating decisional capacity. Some states’ AD laws do not permit surrogate decisionmakers to authorize certain types of mental health intervention, such as psychiatric hospitalization, when the patient cannot give informed consent, and whereas some psychiatric patients might wish to preauthorize treatment using an AD that is irrevocable during a crisis (i.e., when their decisional capacity may be impaired), most states allow medical patients to revoke their ADs if they are merely able to communicate a choice to do so. In theory, a PAD—and even the process of completing a PAD while competent—could facilitate engagement in the treatment process; help to mobilize clinical resources as necessary; improve compliance with beneficial therapies; and facilitate communication among providers, caregivers, and patients and thus help to avert psychiatric crises or improve management of such crises without resorting to coercive commitment.10–15 Hoping for these benefits, an increasing number of state legislatures have adopted PAD statutes and authorized the appointment of proxy decisionmakers for persons with serious mental illness who may anticipate loss of capacity during a mental health crisis. The current study was conducted in five states—California, Florida, Illinois, Massachusetts, and North Carolina—representing a diversity of statutory approaches to authorizing advance mental health care planning. Illinois and North Carolina both have statutes explicitly authorizing psychiatric advance directives. Illinois in 1996 enacted the Mental Health Treatment Preference Declaration Act,16 authorizing both an advance instruction for mental health treatment and a proxy decisionmaker for mental health care termed an “attorney-in-fact.” The advance declaration goes into effect only “if it is determined by 2 physicians or the court that [the principal’s] ability to receive and evaluate information effectively or communicate decisions is impaired to such an extent that [the principal] lacks the capacity to refuse or consent to mental health treatment.” The Illinois PAD can be used to give advance informed consent to mental health treatment including electroconvulsive therapy, psychotropic medication, and admission to and retention in a health care facility for a period up to 17 days. The PAD may be revoked only when the principal is found competent. It can also be used to designate a particular physician to be consulted for treatment decisions during a crisis and to provide any additional information that the principal wishes to include, such as history of illness and treatment and prodromal symptoms that may indicate an impending exacerbation of psychiatric illness. The North Carolina Advance Instruction for Mental Health Treatment17 was passed in 1997 and amended in 1998. This law is similar to the Illinois statute, except that it does not include appointment of a proxy decisionmaker specifically for mental health care decisions. Rather, in North Carolina, a Health Care Power of Attorney (HCPA) may be appointed using the same mechanism that is provided for general health care proxy decisionmaking, (e.g., for end-of-life care). Under this law, a person has the option of completing the Advance Instruction (AI) as a stand-alone document, completing the HCPA without an AI, or completing both documents as mutually reinforcing instruments. California in 2000 passed the Health Care Decisions Law,18 revising its power-of-attorney law and updating rules governing health care decisionmaking on behalf of incompetent adults, including persons receiving treatment in mental health care facilities. The new law promulgated a model form entitled “Advance Health Care Directive” (AHCD) that can serve as both an individual health care instruction and a power of attorney. The California AHCD form was further revised in 2003 to include detailed information on preferences for future mental health treatment in the following areas: who should be notified during a mental health crisis; choice of treatment facility and alternatives to hospitalization; name of primary physician and choice of other physicians to make treatment decisions if the primary physician is unavailable; choices regarding methods for avoiding emergency situations; and choices regarding emergency interventions, routine medications for psychiatric treatment, emergency psychiatric medications, electroconvulsive therapy, persons prohibited from visiting the patient, and “other instructions” about mental health care. In California, an advance health care directive may be incorporated into a comprehensive aftercare plan that is required for all patients discharged from mental health care facilities. In 1997 the California Health and Safety Code19 and Welfare and Institutions Code19 were amended to require all psychiatric facilities to prepare a written aftercare plan and provide copies to the patient, the patient’s legally authorized health care agent (if designated), and any other person or facility requested by the patient. The plan is supposed to include information on medications, dosage and side effects, description of expected course of recovery, ongoing treatment recommendations, and other relevant information to facilitate outpatient follow-up. The California AHCD form also includes a statement intended for clinicians regarding liability and immunity associated with following these directives. Specifically, failure to follow a patient’s advance directive in California may result in liability for damages, negligence, malpractice, and battery claims.20 However, clinicians cannot be held liable for following an advance directive (i.e., they are immunized from civil and criminal liability or from discipline for compliance with AHCDs20). In California, persons can revoke their advance directives either in writing or orally, merely by telling their health care provider that they no longer wish to have either the entire document or certain parts of it enforced. Florida in 1990 passed the Health Care Advance Directive (HCAD),23 which was revised in 1996 to include treatment in mental health care facilities governed by the Baker Act24 with special instructions for how the HCDA interacts with involuntary commitment law. The Florida Department of Children and Families has developed a Mental Health Advance Directive form similar to that used in California, which includes specific information about psychiatric treatment preferences and can be used in conjunction with a legally authorized Mental Health Care Surrogate.25 Florida has also initiated pilot PADs programs in four geographically diverse regions. H1. Past adverse experiences with treatment pressures are associated with motivation to have a PAD. Mental health consumers with a history of adverse personal experiences associated with pressure to adhere to treatment, e.g. involuntary treatment during psychiatric crises, would be more likely to want PADs and be motivated to complete PADs, on the assumption that PADs are intended to prevent such adverse experiences in the future. H2. Disempowerment is associated with interest in PADs and completion of PADs. a. Disempowerment correlates with greater PAD demand. Mental health consumers who are members of disadvantaged or marginalized social groups, or who feel deprived of personal autonomy in their choices, would be more likely to want PADs in so far as PADs are promoted as instruments to empower personal choice and self-determination in mental health treatment, i.e., as a potential remedy for disempowerment. b. Disempowerment correlates with reduced PAD completion. Mental health consumers who feel disempowered and marginalized, despite their high latent demand for PADs, may be less likely to complete PADs, because their lack of resources and disadvantaged social position may pose barriers to completing PADs. H3. Degree of insight correlates with PAD completion. Mental health consumers with high insight into their illness and need for treatment would be more likely to complete PADs, because (a) they may better appreciate the potential benefits of PADs, due to a better understanding of the abstract rationale for PADs, (b) clinicians might be more likely to inform high-insight consumers about PADs and more willing to facilitate PADs for them, and (c) high-insight consumers may have greater cognitive abilities required to complete a complex legal document. H4. Social resources correlate with PAD completion. 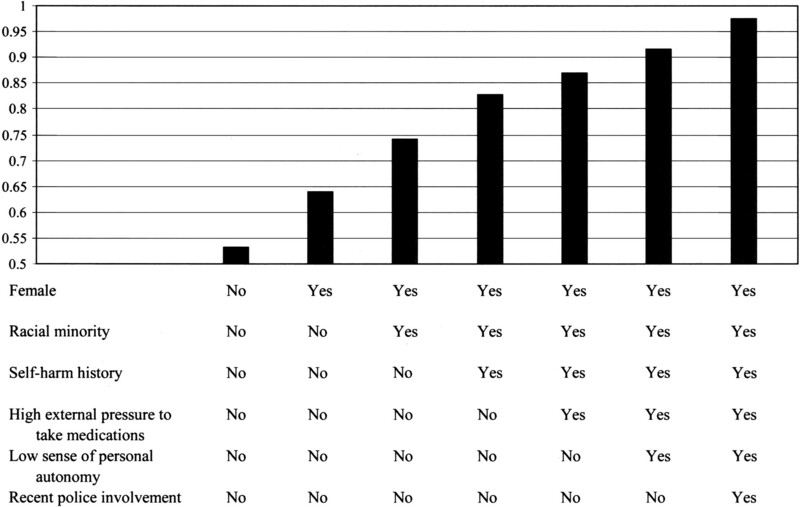 Mental health consumers who are married/cohabiting or have greater social support—and particularly those who have instrumental support for their participation in treatment—would be more likely to complete PADs, because (a) they have greater social resources to assist them in the process, (b) they are more likely to have a trusted person available to authorize as a proxy decisionmaker, and because (c) social network members and caregivers may attempt to influence or pressure the consumer to complete a PAD, i.e., to give the caregiver greater leverage and to avoid conflict and burden during future crises. While our cross-sectional survey was not designed to provide a formal test of causation, we are able to examine bivariate and multivariate patterns of association between PAD completion/demand and a range of characteristics and experiences that are putative indicators of the key terms in these hypotheses (e.g., adverse illness experiences and social support for treatment). By examining these statistical models, we can see whether the patterns in the data are at least consistent with our exploratory hypotheses and thus provide information to refine the hypotheses and guide more definitive research to address these questions in future studies. The methodology of this study is described in detail in Monahan et al.5 In brief, approximately 200 outpatients from publicly funded mental health treatment programs were sampled from each of five sites: Chicago, Illinois; Durham, North Carolina; San Francisco, California; Tampa, Florida; and Worcester, Massachusetts. Sample inclusion criteria were: aged 18 to 65 years, spoke English or Spanish, had first mental health treatment episode at least six months ago, and had at least one outpatient treatment encounter with a publicly supported mental health service provider within the past six months. Persons treated only for substance abuse and not for any another psychiatric disorder were excluded. Otherwise, the inclusion criteria did not specify particular mental health diagnoses or level of acuity. At the Worcester, Tampa, and San Francisco sites, potential subjects were recruited sequentially in the waiting rooms of outpatient clinics of the community mental health centers. In Durham, a list of potentially eligible subjects was created from management information system data, and these patients were randomly selected to be approached for participation in the study. The Chicago site used both sampling methods, enrolling about half the sample using the waiting-room approach and the other half using the eligibility-list approach. Recruiting was targeted at all sites to obtain a sample of individuals meeting the criteria described. Participants were enrolled after receiving a complete description of the study and providing written informed consent. Refusal rates varied from 2 to 13 percent across sites. A single structured interview, lasting about 90 minutes, was administered in person by a trained lay interviewer. Participants were paid $25 for the interview. The protocol was reviewed and approved by IRBs at each of the sites. New questions were developed and pilot tested3 to ascertain whether consumers had completed PADs, or would want to do so if offered assistance. Participants were first given a brief, general description of PADs: “Sometimes people with mental health problems write down or tell someone they trust what kind of medication or other treatment they want or don’t want in the future if they become too ill to make decisions about mental health treatment.” Then they were asked: (1) “Did you ever write down or tell someone what kind of medicine or other treatment you want or don’t want in the future if you become too ill?” and (2) “Did you ever make these instructions a legal document, by having them signed by witnesses?” Only participants who answered “yes” to both questions were coded positive for having completed an instructional PAD. Participants were also given a brief description of health care power of attorney: “Sometimes people with mental health problems choose someone they trust, and give that person the right to make decisions about their treatment in the future if they become too ill to make decisions about mental health treatment.” Then they were asked (1): “Did you ever give someone the right to make decisions about your treatment in the future if you become too ill?” and (2) “Did you ever make this into a legal document, by having it signed by witnesses?” Only participants who answered “yes” to both questions were coded positive for having completed a health care power of attorney. A composite variable indicating completion of either kind of PAD was considered positive if the respondent had completed a legal advance instruction for mental health treatment and/or a durable power of attorney to make mental health care decisions on the patient’s behalf during a future period of incapacity. As an indicator of latent demand for PADs, respondents without PADs were asked whether they would want to complete either of these kinds of legal documents, or both, if someone provided them assistance in doing so. These data were derived from two questions that were asked immediately following the aforementioned items about completing PADs: “Would you want to write down instructions about treatment in the future and make it a legal document if someone showed you how?” and “Would you want to pick a person to make treatment decisions in the future and make it into a legal document if someone showed you how?” Answering “yes” to either of these questions was considered a positive indication of a desire to complete a PAD if given assistance. A modified version of the Duke Social Support Scale26 was administered, with an additional item focused on support for treatment. Specifically, participants were asked whether they had someone who routinely helped them obtain mental health treatment during the past six months (e.g., by reminding them to take medication or transporting them to the community mental health center). Chart diagnoses were used to code participants’ primary psychiatric disorders. The anchored version of the Brief Psychiatric Rating Scale (BPRS)27 was used to assess current psychiatric symptoms. The Global Assessment of Functioning (GAF) scale 28,29 was used to score functioning, with low scores indicating more severe functional impairment. The Insight and Treatment Attitudes Questionnaire (ITAQ)30 was used to assess participants’ recognition and acknowledgment of their psychiatric illness and need for treatment. Subjects were also asked about their alcohol and drug use during the past 30 days. If participants had drunk any alcohol or taken street drugs or nonprescribed psychoactive substances, follow-up questions were asked from the CAGE Questionnaire, adapted to screen for both alcohol and illicit drug abuse.31,32 For analysis, we combined alcohol and drug abuse into a single dichotomous indicator, considered positive if the participant had one or more substance abuse symptoms. To assess treatment appointment adherence, participants were asked to rate their record of keeping scheduled appointments for mental health treatment in the past six months (five-point Likert scale from 1, never missed an appointment, to 5, avoided keeping appointments altogether). Medication compliance was assessed in a similar manner, except a six-point scale was used (1, never missed taking medication, to 6, never took medication). Self-report has some limitations, but no adherence measurement is completely accurate33,34 and self-report has been used in many informative studies of treatment adherence. We used this method because it was cost effective and the most common approach to measuring adherence in the literature on psychosis.35,36 To measure treatment satisfaction, 14 items were used from an adapted version of the Mental Health Statistics Improvement Program (MHSIP) Consumer Survey.37,38 Examples of items were: “I felt free to complain,” and “As a direct result of services I received, I am better able to control my life.” A mean composite score of these items (Cronbach’s α = 0.89) was created as a single, global measure of treatment satisfaction (higher scores indicate less satisfaction). We also assessed subjects’ lifetime experiences of “leverage” in outpatient treatment5—that is, any of four specific tools commonly used to promote treatment adherence. Two of these types of leverage derive from the social welfare system: use of representative payeeship (typically a family member or mental health center assigned by the Social Security Administration to manage a disability recipients’ money) and housing supports contingent on treatment adherence. Two more derive from the judicial system: criminal sanctions requiring treatment and involuntary outpatient commitment (including other functionally equivalent judicial orders). We used logistic regression42 to examine the joint associations between participants’ demographic and clinical characteristics and their receipt of the different types of leverage. For the purpose of multivariate modeling, pooling the data across sites offered the advantage of greater statistical power, but also posed two problems that required adjustment in the analyses. First, we had to account for site effects and site-by-covariate interactions associated with leverage. To examine and control for these site effects, we used Zelen’s test of the homogeneity of odds ratios.43,44 The Zelen statistic allowed us to test the null hypothesis that the relative risk for leverage did not differ across the five sites, but represented a sampling distribution from a common population. If Zelen’s test showed that the sites’ odds ratios for a given variable were homogeneous, we then pooled the data for that variable and calculated a common odds ratio across sites. The second problem was that pooling the data could have distorted statistical inferences, in that the observations within each site were not independent. Without an adjustment for the clustered nature of the data, the standard errors around the pooled estimates would have been understated, leading to overly liberal tests of statistical significance. Accordingly, we used specialized statistical software44 to adjust significance tests and confidence intervals around the common (pooled) odds ratios. For multivariable analysis, we used a companion statistical package designed to conduct multivariable logistic regression with stratified data.45 These techniques provided the appropriate correction of variance estimates, taking into account within-site correlation of observations. Specifically, the software uses the Cochran-Armitage method, as adapted by Rao and Scott,45 to adjust the “effective sample size” for design effects that occur with a clustered sample. Across the sites (pooled n = 1,011), the mean age of participants ranged from 41.3 to 46.7 years. The proportion of male subjects ranged from 32.4 to 64.5 percent and the proportion from minority (nonwhite) racial groups ranged from 31.5 to 65.2 percent. The median level of education was 12 years (high school graduation) and median monthly income was $700. Between 16 and 33 percent were employed at least part time. The percentage of participants currently living with a spouse or domestic partner ranged from 12.5 to 24.5 percent. With respect to the current living situation, between 32.7 and 70.9 percent lived independently, between 20.4 and 50.0 percent lived in staffed residences, between 4.6 and 20.1 percent lived with family, and between 1.0 and 8.7 percent were homeless (lived on the streets). Regarding the primary psychiatric diagnoses, between 41.5 and 49.5 percent had a chart diagnosis of schizophrenia or other psychotic disorder, between 14.4 and 17.6 percent had bipolar disorder, and between 27.5 and 30.7 percent had major depression. Rates of substance abuse comorbidity ranged from 13.86 to 35.5 percent, mean BPRS scores ranged from 31 to 33, and mean GAF scores ranged from 42 to 56 across the sites. Between 36 and 56 percent of participants had been involuntarily hospitalized in the past. Table 1 displays the percentage of participants at each site who reported completing each type of PAD (an advance instruction (AI), legally authorized health care agent (HCA), or either one), followed by the percentage who said they wanted either type of PAD (would complete a PAD if offered assistance in doing so), and finally the total percentage endorsing PADs (either having or wanting PADs). The percentage reporting that they had an existing AI ranged from 2.44 to 7.43 percent, while the percentage with HCAs ranged from 1.95 to 7.43 percent. Overall, between 3.9 and 12.9 percent of participants across the sites reported having one or both types of PAD. There was little overlap between those with AIs and those with HCAs. Of the pooled group with any PAD across the sites, only 16.2 percent (n = 11, or 1.1% of the total sample) reported having both of these instruments combined. While only a small minority of participants at any of the sites had completed PADs, a large majority—66.3 to 77.5 percent—reported wanting to complete PADs if given assistance in doing so. Among those who wanted PADs, there was a large overlap between demand for AIs and for HCAs. Specifically, of all participants who wished to prepare any type of PAD, 68.3 percent reported that they wanted to have both instruments combined, whereas only 18.0 percent wanted to complete a stand-alone AI, and only 13.7 percent wanted to authorize an HCPA without an AI. Table 2 displays associations between participants’ characteristics and PAD completion. We grouped the independent variables into four content domains: (1) demographics and social environment, (2) clinical characteristics, (3) treatment and systems utilization, and (4) leverage (coercion/autonomy) variables. Bivariate relationships between the predictors and PADs are presented as common odds ratios in the first column of Table 2. Significance tests are presented only when Zelen’s test confirmed the homogeneity of odds ratios across study sites. Otherwise, as noted, the tables present the range of site-specific odds ratios. The second column in Table 2 displays adjusted common odds ratios for the variables within each domain, resulting from site-controlled multivariate logistic regression analysis.45 As with the bivariate analyses, all the predictors included in these multivariate domain models were first shown by Zelen’s test to be homogeneous in relation to the dependent variable (PAD completion) across the five sites. In one instance, however, an association that was heterogeneous as a main effect was rendered homogeneous when conditioned by the third variable. This interaction identified a subgroup sharing two characteristics which, in combination, increased the likelihood of PAD completion in a similar (homogeneous) pattern across the study sites. Specifically, that subgroup consisted of married individuals with a history of involuntary commitment, as discussed later. With respect to the first domain (demographics and social environment), Model 1, Table 2, shows that PAD completion was significantly more common among participants who were currently married and had been involuntarily hospitalized in the past and, among those who reported having another person (or persons) providing direct assistance with their treatment (e.g., reminding them to take medication and transporting them to the community mental health center). Regarding clinical characteristics, Model 2 shows that PADs were completed significantly more often by participants with high insight scores (above the median on the ITAQ). Regarding the domain of treatment and system utilization, Model 3 shows that persons who had police involvement in a mental health crisis were significantly more likely to have completed PADs. Finally, with respect to the leverage variables, Model 4 shows that the odds of completing a PAD were significantly higher for those who had a representative payee conditioning receipt of money on treatment and those who reported in general experiencing a large amount of pressure from others to participate in mental health treatment. As shown in Table 2, Column 3, all the significant variables in the domain models were entered into a final logistic regression model, controlling for site differences, and retained at p < .10. However, all of the variables selected in the final model were significant at least at the level of p < .05. In summary, PAD completion was significantly more likely among participants with relatively high insight scores, those who had been taken by the police to a treatment facility, those who had experienced money leverage by a representative payee, and those who reported a high degree of external pressure to participate in mental health treatment (i.e., to keep appointments). Table 3 displays analyses of associations between participants’ characteristics and PAD demand (i.e., reporting a desire to complete an AI, a legally authorized HCA, or both, if given assistance in doing so). Table 3 follows the same structure as Table 2. Considering the first domain (demographics and social environment), Model 1 shows that demand for PADs was significantly higher among female and nonwhite participants and lower among college-educated participants. Regarding clinical characteristics, Model 2 shows that a desire for PADs was more likely among those who reported a history of self-harm. Considering treatment and system utilization, Model 3 shows that persons who had been arrested, those who were frequent utilizers of outpatient mental health services, and those who reported being compliant with prescribed medication were significantly more likely to want PADs. Finally, with respect to experience with legal leverage and other pressures to adhere to treatment, Model 4 shows that the odds of wanting a PAD were significantly higher among those who reported feeling pressured by others to take psychotropic medication and significantly lower among those who reported a high degree of personal autonomy in their lives. As shown in Table 3, Column 3, in the final adjusted model, demand for PADs was significantly higher among female and nonwhite participants, those with a history of self-harm, those who had been arrested, and those who felt pressured by others to take medication and lower among those with a high degree of personal autonomy. It is important to note that these various correlates of PAD demand may, or may not, co-occur in the same people. For example, consumers with high insight and those who have been arrested may both be more likely to complete PADs, but they may be different subgroups of people who are completing PADs for different reasons. Similarly, subsequent analyses showed that PAD demand was significantly higher in a subgroup of participants with affective disorders and no history of involuntary commitment (OR 1.55, 95% CI 1.02–2.35, p < .05; not shown in tables). However, this subgroup had almost no overlap with participants who had been arrested—another subgroup that also had high demand for PADs. Figure 1 illustrates cumulative effects of these variables by graphing the predicted probabilities of wanting PADs, generated from the final model in Table 2, for subgroups having selected combinations of PAD demand predictor characteristics. Specifically, the probability of wanting a PAD is lowest (.53) in the subgroup displayed on the left: male, white individuals with no self-harm history, relatively low perceived external pressure to take medications, a relatively high score on the personal autonomy scale, and no recent involvement with the police. In contrast, desire for PADs is the most likely (.97) in the subgroup on the right: female, nonwhite individuals, with a self-harm history, who feel a high degree of external pressure to take medications, have relatively low scores on the personal autonomy scale, and have had recent police involvement. Probability of demand for PADs in selected subgroups with significant predictor characteristics. An important finding of this study is that only a small minority (4%–13%) of mental health consumers in public-sector treatment settings in five states have completed psychiatric advance directives—this after a decade of effort by consumer advocates to promote PADs and despite the passage of a federal law mandating implementation of advance directives, followed by a raft of new statutes authorizing PADs in some 20 states. Indeed, rates of PAD completion were no higher in the states with explicit PAD statutes (North Carolina and Illinois) than in the states without them (California, Florida, and Massachusetts). Equally important, however, is the apparently large latent demand for PADs. Between 66 and 77 percent of consumers say they do not have a PAD but want to complete one and would complete a PAD if offered the necessary assistance. Moreover, most consumers who desire PADs say they would like to have both kinds of PADs in combination. They would complete an instructional directive for their mental health treatment during a crisis and would authorize a proxy decisionmaker with health care power of attorney (i.e., to implement their treatment preferences during a future period of incapacity). Beyond this broad picture of low prevalence but high potential interest in PADs, this study also provides new, specific information concerning the correlates, putative causal factors and motivating influences associated with PAD completion and demand. We found some evidence consistent with Hypothesis 1—that past adverse experiences with treatment pressures are associated with motivation to have a PAD. Specifically, we found that mental health consumers who reported experiencing a high degree of pressure to take medication were significantly more likely to want a PAD. A related finding is that consumers who felt pressured by others to attend treatment were more likely to complete PADs. Consumers who had recently been arrested were significantly more likely to want PADs, and consumers who had recently been picked up by the police and transported to treatment were more likely to complete PADs as well. We also found that consumers with a history of suicidality or self-harm were more likely to want PADs—perhaps motivated by a self-protective intent to obtain timely treatment when needed in the future (i.e., treatment that may have been lacking during a past crisis resulting in suicidal behavior). However, we do not know the causal direction or mechanism underlying these associations. Hypothesis 2a—that disempowerment correlates with greater PAD demand—is supported by our finding that latent demand for PADs was significantly higher among consumers with low personal autonomy scores and among female, nonwhite consumers. Our analysis provided limited support for Hypothesis 2b—that disempowerment correlates with reduced PAD completion. We found that the odds ratios for PAD completion associated with being female and nonwhite, while significant positive correlates of PAD demand, were both in the negative direction (nonsignificant) as predictors of PAD completion (.89 and .75, respectively). We found direct support for Hypothesis 3—that high insight correlates with PAD completion. Specifically, participants with ITAQ scores above the median were twice as likely to complete PADs as their counterparts with low ITAQ scores, controlling for all other significant variables in the final model. This finding may be important given some clinicians’ concern that patients with low insight will use PADs inappropriately to document advance refusals of psychiatric medications. Will such refusals hold up to legal challenge? This question is especially pertinent in the wake of Hargrave v. State of Vermont,46 which struck down a state law that allowed mental health professionals to override a person’s advance refusal of psychotropic medications through a general health care proxy. If applied as a broad precedent, the Hargrave decision by the 2nd U.S. Circuit Court of Appeals could be used to challenge any of the new PAD statutes that allow doctors to override PADs that conflict with community standards of psychiatric practice. Finally, we found some evidence consistent with Hypothesis 4—that social resources are associated with PAD completion. Consumers were significantly more likely to complete PADs if they had another person (or persons) providing support for their mental health treatment (e.g., transporting them to the clinic for appointments or reminding them to take medication). This association was significant when controlling for other variables in the demographics and social environment domain, but failed to retain significance in the final model. In addition, being married or cohabiting was associated with PAD completion, but only among a subgroup of people with a history of involuntary commitment and only in the domain model. Still, this interaction is interesting because it may provide evidence of two kinds of effects operating together: adverse illness history motivating PADs (Hypothesis 1) and social resources providing opportunity for PADs (Hypothesis 4). We found that the completion of PADs was significantly higher among individuals who had a representative payee and had experienced pressure to participate in treatment as a condition of receiving money. This association, which remained significant in the final model, is interesting because it also provides support both for Hypothesis 1 (treatment pressure motivates PADs) and Hypothesis 4 (social resources enable PADs.) In particular, subjects with representative payees have immediate access to someone they trust to manage their affairs. Such an individual could also be a potential HCA candidate. Thus, the opportunity to authorize a surrogate health care decisionmaker legally may be greater for persons who already have a representative payee. These findings pose an important question about the large gap between the ostensible desire for and actual completion of PADs. Partial explanation may come from these hypotheses—that marginalized consumers lack the social resources to enable completion of PADs. In addition, illness processes, including cognitive impairment, may pose barriers to completion. Or, consumers with mental illnesses may simply be unaware that PAD laws exist. Likewise, clinicians may not be familiar with these laws and thereby may lack the knowledge to help consumers complete PADs. However, we also suspect that many states, struggling to pay for adequate mental health services, have not invested serious resources to educate stakeholders about PADs or to assist consumers in completing them. Further, many states have failed to educate mental health facilities about their obligations to comply with PAD legislation. The Joint Council on Accreditation of Healthcare Organizations has not yet fully incorporated PAD compliance in their surveys (Bernstein R, personal communication, October 2004). This study is limited in several ways. A cross-sectional survey of this nature cannot establish causality between variables that are found to be associated. We do not know whether the correlates of PADs were, in fact, causal determinants of PAD completion or demand in any case. For example, whereas we know that respondents with a history of self-harm were statistically more likely to want PADs, we do not know whether, or why, this characteristic may have shaped respondents’ experiences and attitudes to make them more favorable toward PADs. In that regard, our interpretation of the evidence in support of our hypotheses should be regarded as preliminary, pending confirmation by more definitive studies in the future. Also, we caution that the site-specific estimates of PAD prevalence and demand reported herein cannot be combined or averaged across sites to produce national estimates for the U.S. population. The five sites were not chosen at random and they used variations on a common approach to sample selection. In their demographic and clinical characteristics, the samples differ from each other on several variables associated with demand for PADs. The samples also differ from broader, nationally representative survey samples of individuals who receive specialty mental health services in the community. For example, compared with respondents from the NIMH National Comorbidity Study47 who were in active treatment for mental disorders, our samples included a significantly higher proportion of males, individuals with a psychotic disorder, and outpatients who used services at a high frequency. However, national survey samples may not adequately represent individuals with severe and persistent mental illness. More than a decade has passed since the federal Patient Self-Determination Act mandated that health care facilities support the completion of advance directives for all patients who wanted them through specific implementation policies and procedures. And yet, we find little evidence that any such policies have been implemented to the benefit of persons with serious mental illness who may wish to complete psychiatric advance directives. This survey, conducted in five states with diverse populations and mental health service systems, found that, whereas about 7 in 10 consumers in public-sector treatment would like to complete a psychiatric advance directive (and say they would do so if provided assistance), fewer than 1 in 10 have actually completed one. Apparently, significant barriers are preventing consumers from taking advantage of PADs. Such barriers include lack of awareness of PAD laws, misunderstanding PADs, and lacking economic and other resources that may be necessary to complete PADs. This study also provides evidence that some of the key motivating factors underlying the high demand for PADs may lie in a nexus of adverse experiences common to persons with chronic, disabling psychiatric conditions—problems that PADs are specifically designed to ameliorate: coercive, unwanted, or inadequate intervention during mental health crises and disempowerment in the treatment decisionmaking process. Can PADs actually do anything to remedy such entrenched problems, and under what conditions? Or is the hope for PADs fundamentally misplaced? These questions await further research. In the end, systemic barriers and strong resistance from clinicians may prevent PADs from working as intended. But one thing seems clear: the potential benefits afforded by PADs will never be realized unless resources are expended to facilitate and assist consumers in completing them.